The launch of Apple Watch Series 4, last fall, made innovation waves all around the globe. The smartwatch can measure a user’s heartbeat in a way previously reserved only for medical equipment. And this is just one example of a forward-looking digital health technology that enables doctors to transform the lives of millions of Americans suffering from cardiovascular diseases. There are at least 9 other technologies every cardiologist in America should know about. Cardiovascular health technologies encompass all the devices and procedures that enable physicians to streamline the diagnosis and treatment of heart conditions. Some emerging cardiac technologies doctors are currently experimenting with include artificial intelligence (AI), blockchain, Alexa skills, and chatbots. According to clinical studies, digitally-enabled cardiovascular interventions can improve outcomes for patients and have led to a 23% reduction in hospital readmissions. Even with only a cursory glance, these numbers show a dire reality. Cardiovascular disease is nothing to joke about and is a disease that causes grave concern for every physician. The question these figures presents is: how can doctors affect these numbers in ways that improve patient health and ultimate outcomes over time? The multifaceted causes for cardiovascular diseases range from environmental to genetic to cultural. The technologies presented in this article address each aspect individually. Every doctor, and diagnosed patient, should be aware of them. Big data is a fancy term for the process of analyzing complex data sets in order to gain accurate insights that can be employed when trying to solve a specific problem – medical or otherwise. There is ample data on multiple aspects within the cardiovascular disease specialty. Two recent peer-to-peer reviewed academic articles have shown how big data can be used to prevent cardiovascular diseases and assist in generating early diagnoses. The first one, “System Framework for Cardiovascular Disease Prediction Based on Big Data Technology,” was published in the November 2017 issue of the journal Symmetry. The researchers looked at a wide variety of factors that could be used to predict the likelihood that certain populations will develop cardiovascular diseases over time. As it turns out, big data models can predict the likelihood that a patient will develop a cardiovascular disease by looking at clinical, genomic and lifestyle data through disease correlations, drug side effects, and genome research. Environmental pollution: fine dust (PM2.5) exposure, high carbon dioxide concentration, etc. A second study, published in the May 2018 issue of the journal, BioMed Research International, shows big data can correctly predict the likelihood of a person developing cardiovascular disease in 80% of cases. Most importantly, this article shows a comprehensive list of factors that are most likely to lead to cardiovascular diseases. These factors include: gender, chest pain type, resting blood pressure, serum cholesterol, fasting blood sugar, ECG, maximum heart rate achieved, exercise induced angina, old peak, slope, and number of major blood vessels colored by fluoroscopy. Bottomline: big data is big news for doctors. While most predictive analytics models currently exist primarily in academic settings, in the near future doctors will have access to complex databases where a specific patient’s characteristics can be entered to obtain the likelihood of that patient developing a cardiovascular disease with more than 80% confidence. Ultronics is a UK-based artificial intelligence company that is employing technology to revolutionize cardiovascular disease diagnostics. In 2018, Ultronics received a $10M grant to further their product and make it commercially viable. Developed at John Radcliff Hospital, the Ultronics system uses topological analysis to interpret thousands of data points obtained from a single echocardiogram to detect coronary heart diseases at an early stage. 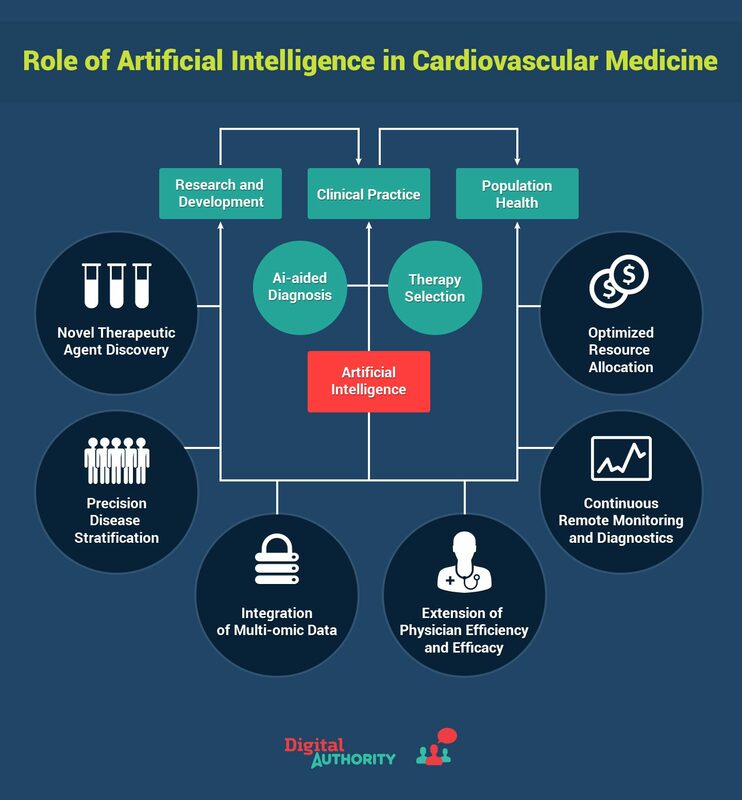 The image below shows the impact AI is having on the entire cardiology field, from early detection and prevention of cardiovascular diseases to long term care and patient management. AI will drive improved patient care because physicians will be able to interpret more data in greater depth than ever before. Reinforcement learning algorithms will become companion physician aids, unobtrusively assisting physicians and streamlining clinical care. Advances in unsupervised learning will enable far greater characterization of patients’ disorders and ultimately lead to better treatment selection and improved outcomes. 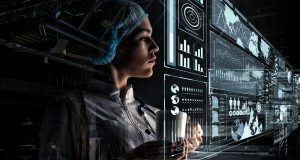 Indeed, AI may obviate much of the tedium of modern-day clinical practice, such as interacting with EHRs [electronic health records] and billing, which will likely soon be intelligently automated to a much greater extent. Bottomline: AI is increasingly being used as a tool to help doctors make better decisions, not replace them. 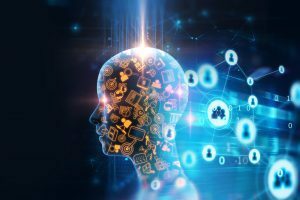 Artificial Intelligence is a technology that allows massive amounts of data to be fed into algorithms which then assist physicians in making the best decisions about the health of their patients. After proving its efficiency in various industries from banking to real estate and supply chain, blockchain technology is slowly gaining momentum in the healthcare world. When it comes to cardiovascular diseases, this technology is helping patients get faster access to life-saving treatments. Farasha, a startup with headquarters in France and the U.S. has designed the first watch to analyze, alert, and prevent cardiovascular diseases in real-time using artificial intelligence and blockchain smart contracts. They are a computer protocol designed to make digital transactions faster and more secure. Smart contracts are also used to store patient records in a digital ledger. For Farasha, the benefits of hosting its massive collection of patient data on the blockchain ledger has manyfold benefits. First, patient information becomes extremely hard to hack. Second, blockchain guarantees reliable and fast data exchangeability, which means patients will get timely access to diagnostic services and treatment. It also ensures that providers get accurate payments. Farasha took things a step further and created a cryptocurrency for its services. By removing the need for a third party such as a bank, the company managed to speed up transaction settlements. But the biggest potential that blockchain-based smart contracts hold is to revolutionize the sharing of electronic health records (EHR). Health providers are currently using multiple electronic health record (EHR) systems to record patient data. This often leads to medical errors, which happen to be the third leading cause of death after heart disease and cancer. On top of seeing tens of patients a day, physicians and nurses spent hours in front of a computer, manually logging in every bit of information. One wrong key pressed and a heart patient could easily get a higher medication dosage. One overlooked symptom and someone at risk of cardiac disease might die a couple of days later. What’s more concerning is that heart patients don’t have the luxury to wait for their information to be printed and faxed from one physician to another. Smart contracts can solve this problem. Hundreds of thousands of deaths from heart attack and stroke and cancer could be prevented each year if these patients were in charge of their personal health information via an EHR system powered by blockchain technology. Several startups like Medicalchain are experimenting with blockchain technology to streamline the sharing of medical documents and remove conflicting information by giving patients ownership of their health records. Last but not least, blockchain, an incentive-driven technology, is being used to encourage healthy behaviors among patients with heart problems. Recent studies show that by adopting a healthy lifestyle, patients can cut their risk of heart disease by half. Startups like Minthealth are currently testing this theory. Every time patients take care of their heart health either by achieving their daily step goals, watching educational health materials such as webinars, or measuring their blood pressure, the company rewards them with tokens called Vidamint. Patients can later exchange the Vidamints for lower insurance premiums or other rewards such as goods from Amazon or Wholefoods. Voice-enabled technology is already making impressive strides towards improving health outcomes for heart disease patients. The leader in this area is, by far, Amazon’s Alexa. Let’s take a look at some examples of how the voice assistant is making itself indispensable to cardiac patients. According to the Center for Disease Control and Prevention, someone in the United States has a stroke every 40 seconds. While immediate cardiopulmonary resuscitation (CPR) can increase chances of survival up to three times, just over half of Americans know how to perform this emergency procedure. Thanks to a skill developed by the American Heart Association (AHA), asking Alexa to walk you through the steps of CPR is as easy as ordering a pizza. AHA’s skill also help users recognize heart attack and stroke symptoms. Recently, the AHA started accepting donations through Alexa. Dozens of other skills are designed to help prevent heart disease. Medical device manufacturer Omron Healthcare built a new Alexa skill that allows patients who use their blood pressure monitoring devices to manage their condition using voice commands. Left untreated, high blood pressure can lead to heart failure. All users have to do is pair their Omron cuff to the company’s app and ask the Alexa to read their latest blood pressure results and get alerts for anything that may be considered higher than usual. Voice-enabled solutions for cardiac patients are also making their way into some of the most prestigious hospitals in the U.S. Mayo Clinic is on the verge of proving that voice signal analysis can become a noninvasive diagnostic tool. While the vocal features that indicate heart disease are not perceived by the human ear alone, the Rochester-based medical center discovered that a voice-analyzing app can help detect coronary artery disease based on a patient’s tone and intensity. Another pilot study conducted by The Journal of the Acoustical Society of America vouches for this technology’s efficiency in lowering healthcare costs and reducing mortality rates among patients with heart failure. Chatbots are artificial intelligence messaging programs designed to elicit information from users and provide answers based on user input. In other words, they are an automated channel for collecting information that doctors can use to make a health assessment or for help to decide what medicine, if any, should be prescribed. High blood pressure and other cardiovascular diseases are the most frequent causes of return visits for doctors. For example, patients with phase 1 hypertension see their primary physicians, on average, once every 2 months while those suffering from stage 2 hypertension see their doctors once every 2-3 weeks (source). Because cardiovascular diseases are so prevalent, smart chatbots are an exceptional tool for collecting relevant information and can make a doctor’s work much easier. A chatbot can collect routine information from a patient and then pass that information directly to the primary physician. This type of technology can be easily integrated with other software systems doctors already use in their current practices. Bottomline: Chatbots currently exist on the market in various shapes and forms and are perfectly equipped to help doctors treating patients suffering from cardiovascular diseases. Since cardiovascular diseases are so prevalent, doctors should explore the chatbot options that can best be integrated with their existing technologies and use them to collect critical information for more accurate patient care plans. An article published in the April 2018 issue of the journal Clinical Cardiology documents at length how mHealth technologies have been helping patients with cardiovascular diseases adhere to heart‐healthy recommendations designed to modify users’ cardiovascular risk‐factor profile. According to the article, how patients living with cardiovascular diseases manage their health has changed dramatically in recent years as a result of the proliferation of smartphone usage among Americans and the complimentary proliferation of mHealth applications. Mobile health applications provide real‐time tracking, feedback, and motivation for physical activity levels, effectively altering the life choices of many patients for the better. 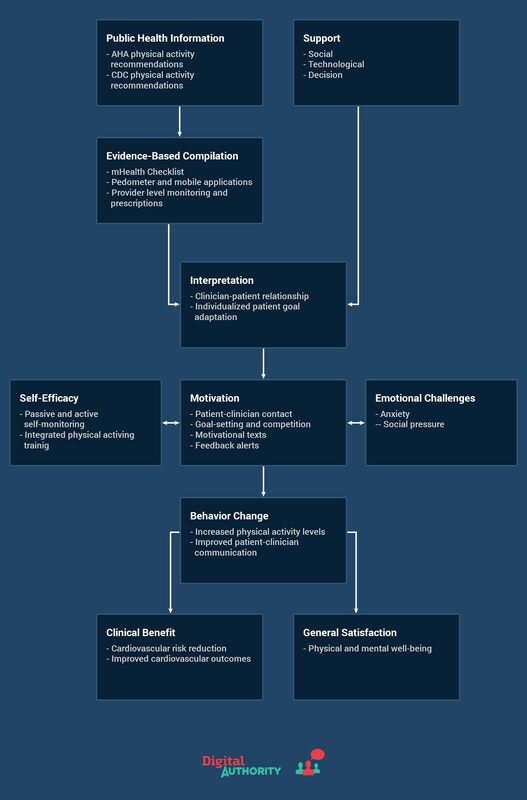 Check the infographic below from Clinical Cardiology, showing the clinical benefits achieved from doctors encouraging their patients to employ mHealth technologies in their daily activity choices. As the knowledge that patients with cardiovascular diseases can improve their condition over time by employing health technologies becomes more mainstream, we’re seeing hospitals and clinics increasingly adopt these technologies. For example, a 2014 medical study shows that 42% of hospitals had already adopted some form of telehealth applications to their existing workflows. Bottomline: Any doctor treating patients for cardiovascular diseases should consider suggesting mHealth technologies to their patients. These stimulating and gamified mobile apps have proven very successful at motivating patients to improve their modifiable risk factors and, as a result, they’ve been proven to reduce cardiovascular risk-factor profiles. In 2016, the American Heart Association published a policy statement encouraging the use of telehealth applications in order to improve cardiovascular and stroke care. This was a bold move for a wide variety of factors. On the one hand, as previously argued, telemedicine is the future of healthcare. There were an estimated 30 million telehealth visits in the US in 2017, compared to 22 million in 2016. Furthermore, according to a 2015-2016 survey conducted by the Brigham and Women’s Hospital and reported by the Harvard Business Review, 97% of patients were satisfied with their first telehealth experience, and 74% believed that the tool improved their relationship with their healthcare provider — showing that the technology is a step in the right direction. On the other hand, physicians’ uncertainty regarding the liability of using telehealth apps as well as concerns over reimbursements have contributed to a less than expected adoption of telemedicine technologies in the US. Remote monitoring of patients with implantable cardiac devices resulted in timely diagnosis and management of arrhythmias and heart failure symptoms, leading to better clinical outcomes. Also, using telestroke to evaluate patients with acute ischemic stroke eligible for thrombolysis provided access to acute stroke care in underserved areas and has been shown to be as safe and effective as usual care. Bottomline: Telemedicine applications are exceptionally well-equipped to connect physicians with patients who live in remote areas of the country or to quickly offer a consultation to patients living with chronic cardiovascular diseases. Every doctor should consider offering this service to patients in order to improve quality of care and patient outcomes. An academic article published in the 2015 Annual Review of Public Health examined the impact of leveraging text messaging technologies in patient-physician interactions. The article concluded that text-messaging interventions are very effective tactics for addressing a wide variety of conditions associated with cardiovascular diseases including: weight loss, physical activities, medication adherence, and other treatments. Not only are text messages one of several simple health technologies for doctors to include in patient care, but they are also the most effective means by which to actually reach a patient on a recurring basis. For example, 99% of text messages sent by physicians are opened–90% of those are read less than 3 minutes after they are received by patients. Text messaging platforms such as TigerConnect or DrFirst are secure, relatively easy to implement messaging platforms that doctors can incorporate into their interactions with their patients. More importantly, a wide variety of clinical studies have concluded that text messaging platforms have a statistically significant effect on behavior change and chronic disease self-management. According to a 2012 review study in Health Informatics Journal, the use of text messaging by doctors has led to a significant reduction in both body mass index and blood pressure among patients. Another medical study, from 2014, shows significant improvements in medication adherence among patients with chronic conditions who were contacted by their physicians via text message platforms. Bottomline: Text messaging platforms are low cost, high benefit health technologies that have been used and studied for almost a decade. When treating patients with cardiovascular diseases, doctors should consider investing in these technologies as they show strong evidence that this simple technological effort can improve the quality of care and patient outcomes over time. Since 2008, Geisinger Health Plan (GHP) has implemented a telemonitoring program that specifically targets patients suffering from heart failure. 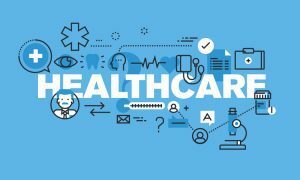 The article looked at the data collected from patients who enrolled in the study and measured their hospital admission rates, readmission rates and total cost of care for the patients who were enrolled in the telemonitoring program. GHP provided Advanced Monitored Caregiving Bluetooth scales with an Interactive Voice Response (IVR) system to members with heart failure. The IVR system included a list of questions specifically designed to detect changes in physical condition indicating exacerbation, such as shortness of breath, swelling, appetite, and prescription management. To fully utilize the system, the member needed to have a landline or cellular phone service to transmit weight measurements via the Bluetooth-enabled scale and to take the IVR calls. Data was collected over a period of 5 years and compared against data from patients suffering from heart failure who did not enroll in the program. The study confirms a simple fact. Whereas in-person meetings between physicians and patients can lead to life-altering decisions with regards to one’s health and physical activity, patients suffering from cardiovascular diseases are significantly more likely to improve their condition over time when they benefit from digitally-connected solutions that help them manage their chronic conditions over time. Health technologies are here to stay and will continue to have a positive impact on physicians’ work in the long term. In this article, we have covered some of the most exciting new technologies being implemented by doctors all over the world. Although some may have a restricted use at this time, they all have the potential to create a positive impact on doctors’ work today and in the years to come.